Download the article about Spring rose care by Joelen Adams, a member of the Horticulture Team at CGCI, that was provided to us by Sharon Thorne. 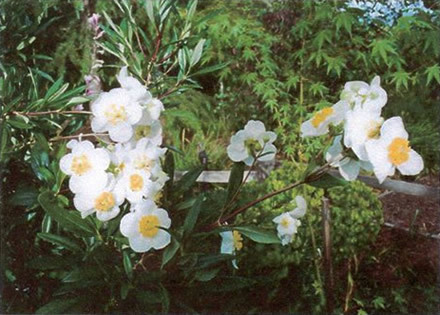 Endemic to Sierra Foothills of Fresno County, this handsome, adaptable shrub is utilized by gardeners throughout the Pacific States and Europe. 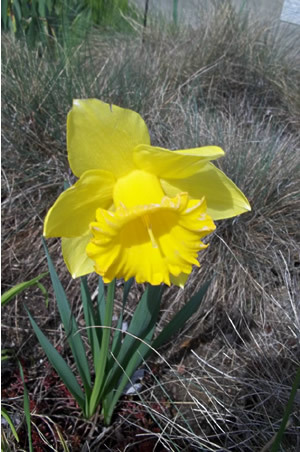 It is appropriate to feature the Daffodil because our club's traditional spring tea is named for this flower. They are a lovely sight growing in yards and fields or as a cut flower. 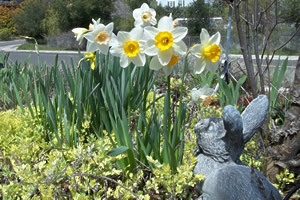 A perennial, the daffodil grows very well in Lake County's cold and hot weather, increasing from year to year. The gophers may move them around but won't eat them. 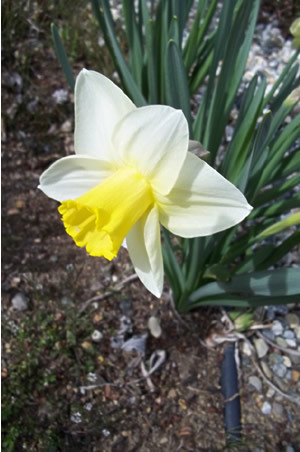 There are 11 generally recognized divisions of daffodils with varieties in each division. 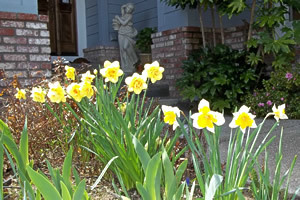 Plant daffodil bulbs in the fall for early spring blooms. Let foliage ripen naturally after bloom. Lift and divide clumps after foliage has died down. Replant at once or store for only a short time (not over 3 weeks). 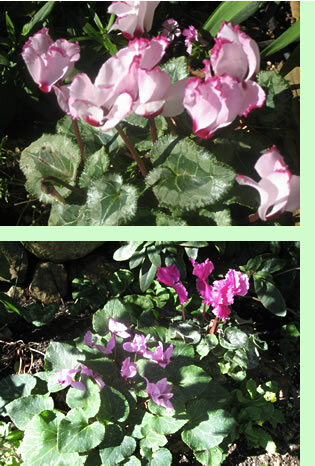 The cyclamen is a wonderful perennial plant. The white, pink, rose, red or salmon blossoms resemble shooting stars. They are abundant for sale in January and early February. They prefer filtered sunlight and a rich, moist humus soil. As for all plants drainage is important. Pull out the whole stem of spent blossoms to avid rot and prolong the bloom season from January to mid-March. When planting, the top half of the tuber needs to be above the soil. Do not cultivate around the tubers or expose the plant to hot afternoon sun. The patterned heart shaped leaves keep it attractive when not in bloom. There is a short dormant period in summer, and then it flourishes again. English primroses are a good companion plant. 6-15 ft. Evergreen. 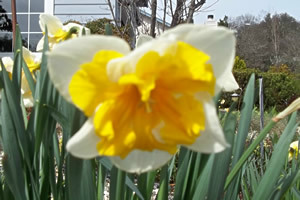 Large, Clear, Bright Yellow Flowers Bloom May-June. Leaves are dark green. Three-lobed with felted appearance. Full sun in poor, well drained soil. Propagate from tip cuttings. Excellent accent plant and is especially striking when accompanied by one of the blue California Lilacs. 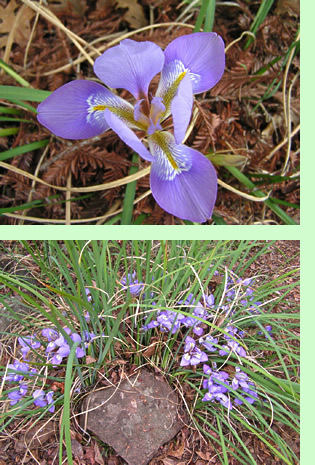 WINTER IRIS: I. unguicularis (I. stylosa). Dense clumps of narrow, dark green, 1-2 ft. leaves. Lavender blue flowers, with 6-9in. tubes that look like stems, appear in November (where winters are mildest) to January-March. Use along paths, in borders. Slugs attracted to flowers. Sun or shade, any soil, much or little water. To reveal flowers partly concealed by foliage, cut back tallest leaves in September; also divide overgrown clumps at this time or in March-April after flowering. Perennial Subshrub: Deer resistant, Native of South America. Dediduous bedding, container, border and cut flower plant. Flowering time: summer-fall. Attracts butterflies, hummingbirds and bees. Height: 3-3 1/2 feet. exposure: sun. A. "Silky Deep Red", a deep orange red and A. "Silky Gold",yellow flowers. The butterfly eggs are laid on the underside of the plant. When it becomes a caterpillar, it eats the leaves. We raised Monarch butterflies on this plant. Perennial. Native to South Africa. Most elegant and sophisticated of daisies. Lobed leaves to ten inches long spring from root crown which spread slowly to form big clumps. Slender-rayed four inch daisies (one to a stem) rise directly from crown on 1 1/2 ft. erect or slightly curving stems. Colors range from cream through yellow to coral, orange, flame and red. Blooms any time of year with peaks in early summer and fall. Best in full sun: partial shade in hottest areas. Needs good soil with excellent drainage. Where drainage is poor, grow in raised beds. Plant 2 ft. apart with crowns at least 1/4 inch above surface. Protect against snails and slugs. Feed frequently. 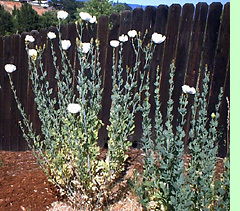 When plants become crowded; divide February-April, leaving two or three buds on each division. According to Carol Kesey who has beautiful Transvaal Daisies in her Lakeport yard every year "You need to avoid using acid fertilizer. Also they like to be planted near cement." Perennial. Grows well in Lake County. Stalkless leaves 1 1/2 - 3 1/2 inches long grow directly on long, very thin stems. Branching flower spikes bear many 1 inch long blossoms closely set on the stems. Blossoms come in pink or white. Self sewing. Plant in full sun. Fairly draught tolerant. Good in cottage gardens or borders. These California natives can take dry, hot summers. They do well in Lake County. Reseed themsleves and have invasive roots. 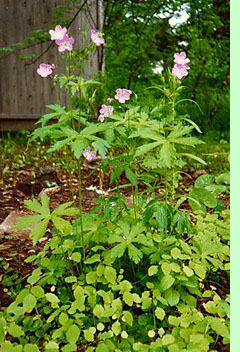 Grow in full sun in informal gardens, rock gardens, on banks or hillsides. 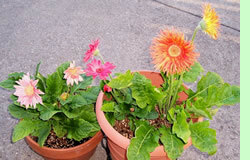 Have 1/2 - 1 1/2 inch long gray green narrow leaves and bright red trumpet shaped 1 1/2 - 2 inch long flowers. A wonderful, prolific, summer blooming, large shrub for Lake County. Flowers resemble lilacs. It's a favorite nectar plant of butterflies and hummingbirds. Especially welcomed by them as food before migrating as it blooms here July, August and early September. Deciduous or semi evergreen shrub , 6-10 ft. tall. Likes well drained alkaline soil. Full sun or light shade with moderate water. Colors available: newest color "Bicolor" with two different colors on same stalk; "Honeycomb" yellow; "Raspberry Wine" rose mauve; "Black Knight" dark blue; "Pink Delight" pure pink; "Alba" white; "Nanho Blue" medium blue and "Harlequin" purple red. GERANIUM - Geraniaceae - "Cranesbill"
Hardy perennials. 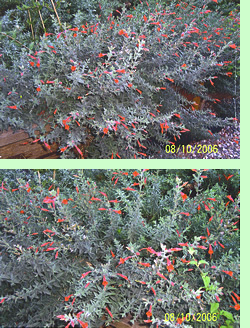 Near-evergreen leaves, bloom over a long period in summer and fall. 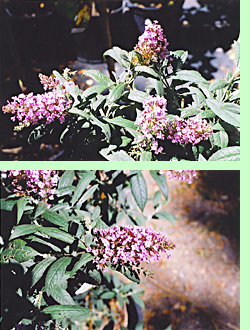 Flowers borne singly or in clusters of 2 or 3. Flowers have 5 overlapping petals, all alike in appearance. Colors include rose, blue and purple, few are pink or white. Leaves are roundish or kidney shaped, lobed or deeply cut. Plants may be upright or trailing. Prefer full sun, but may tolerate light shade. Need constant moisture for good performance. Good in rock gardens. Most varieties will grow in our zone. Prune close to a node and disinfect your knife between cuts in 5 percent Formalin or denatured alcohol. Frequent pinching back instead of occasional heavy pruning is preferred. Some of the varieties for our zone are G. cinereum, G. endressii, G. himalayense, G. macrorrhizum, G. prayense, G. sanguineum and G. wallichianum. Tender annuals, perennials or shrubs. Mostly grown as house plants or annuals in Lake County. They come in many colors. Scented varieties may be used in potpourri and sachets. 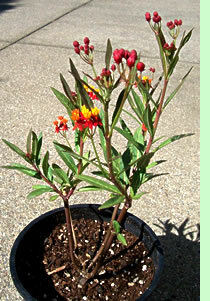 Plant in full sun or some shade, well-drained soil, little fertilizer. Allow to dry between watering. They endure light frost but not heavy freeze: some will not tolerate temperatures below 35 degrees. Use in pots (they love to be potbound), planters or hanging baskets. Most commonly propagated by cuttings. Take 2" cuttings with no more than two leaves. Remove wings on stem and take center out with a sharp knife. Use builders sand as planting medium. Insert about one half of stem into medium. Keep medium slightly moist. Then double pot and leave in doors or under protective covering. Soil: Anything with good drainage. Ideal on sunny slopes and good erosion control, ground cover and for cut flowers. Propagtion: Seed, cuttings, suckers, division. The best is root cuttings clumps. Plant five cutting to get one plant. Once established it will spread even under asphalt according to Dr. Woods of Scotts Valley. Water only 1x/mo in the summer for the first two years. If you water a little during the summer you will have a longer blooming period. Pruning: Remove dead parts, cut back in fall to soil level. It doesn't like water and the deer doesn't like it. It grows 8' and 15' wide. 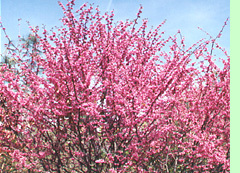 Our club flower is the cercis occidentalis, WESTERN REDBUD also known as the "Judas Tree". The redbud has been designated the official flower of Lake County. It is native to California, Arizona and Utah but predominantly in California foothills below 4,000 ft. It can be a shrub or small tree and has brilliant magenta flowers in spring with summer foliageof handsome blue green 3" leaves, notched or rounded at the tip. Excellent for dry, seldom watered banks. Water regularly in first year or two to speed growth. 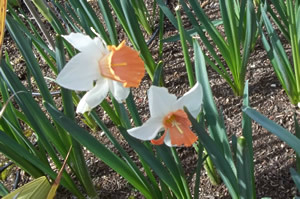 Profuse flower production only where winter temperatures drop to 25 degrees F. or lower. Resistant to oak root fungus.